Five-layer magic bars made with coconut, chocolate chips, butterscotch chips, and toasted pecans held together by condensed milk on a graham cracker crust. 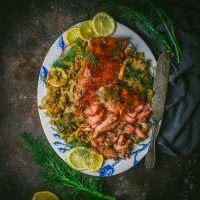 I sometimes have a tricky time starting these posts, and true to form, for this recipe I got stuck on the very first word of the post title. 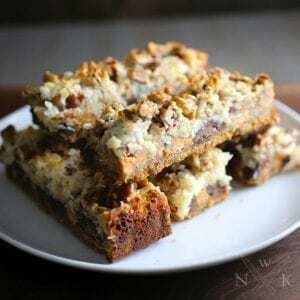 FIVE-layer magic bars. Is it really five layers? Or is it three? Or four? Honesty in cooking is pretty important, right? 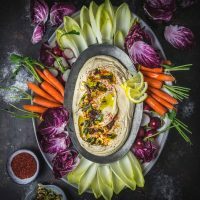 There are certainly more than (but not MUCH more than) five ingredients, and you do assemble the bars in neat layers, so really, it can be as many layers as YOU think it is. Or you can just make them and not worry too much about it. We made these to take to a local bake sale last weekend called For Goodness Bake. This is the third year that it has been organized, and each year the proceeds go to a different worthy local cause. This year it was the Green Teens, an offshoot of the Cornell Cooperative Extension which teaches farming, gardening and other food-related skills to local teenagers. We wanted a baked good that was portable (i.e., not too goopy), could be divided into convenient slices, and was (most important) really delicious. And something that didn’t take too long to put together. 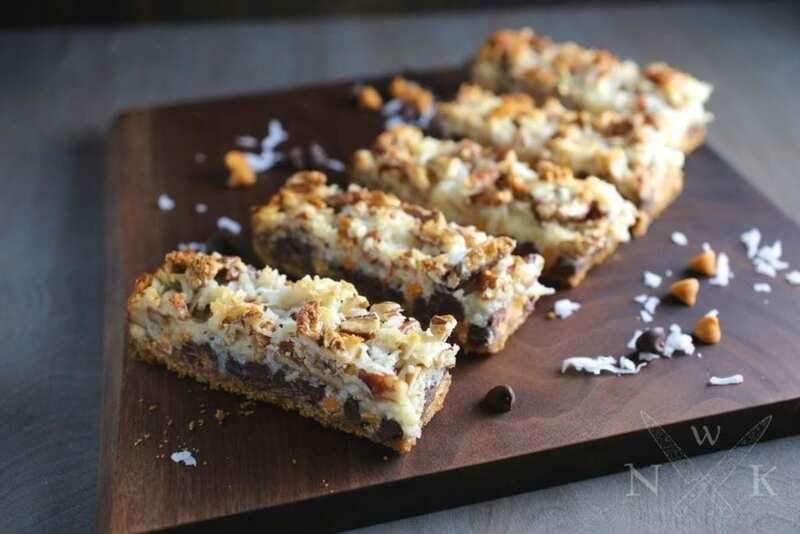 These magic bars fit the bill on all counts. They’re crunchy from the pecans and toasty coconut. They have a decadent layer of chocolate and butterscotch. And as the sweetened condensed milk bakes, it takes on a deep, almost caramelized flavor (like Dulce de Leche). Of course we put our own little nerdy spin on the classic version and in this case it’s an extra thick, just a touch salty graham crust. The great thing with these bars is that you can pretty much add whatever you want to them. Don’t like pecans but love macadamias? Go for it! Want to put a holiday spin on it? Add some dried cranberries! Two things to keep in mind; they are very sticky so don’t skimp on lining the pan with parchment paper. If you don’t, you will probably have a very difficult time getting them out. The other thing is, don’t pack the crust down too firmly because you want the condensed milk to saturate the crumb layer as well. You can press enough to shape it, but don’t mash it solid. Preheat oven to 350F. Line a 9 x 13-inch baking pan with parchment paper. Mix the graham cracker crumbs, butter, salt and 1 tablespoon water and toss until moist. (It should be the texture of damp sand. If it's too dry, add the other ½ tablespoon of water). Pat the mixture - don't press too hard - into an even layer in the baking pan to form a base. Sprinkle the chips and morsels over the crumb base. Sprinkle coconut and pecans over the chips. Drizzle the milk over the top. Bake at 350° for 25 minutes or until lightly browned and bubbly around edges. 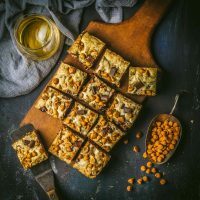 Place pan on a wire rack to cool completely, then refrigerate for at least 30 minutes before cutting into bars or squares. The bars can be kept at room temperature, in an airtight container, for up to 5 days. Nice. Saved this when I came across the post on Reddit, now it’ll be in my Foodgawker file. Will be making these very soon. Thanks! These bars look great.. and I really want to make them. Shame it’s so hard to get graham cracker crumbs here in Australia though! It’s true tha graham crackers are AMAZING. 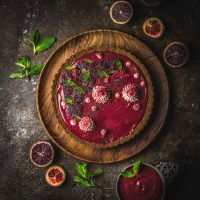 Something about the texture is just perfect for crusts but you could use any not too sweet cookie or digestive biscuits. You might want to add just the tiniest hint of cinnamon (like an 1/8 of a teaspoon) to mimic the flavor. You might look for Arnott’s Shreddded Wheatmeal – I think they’re the closest thing. I’ve heard McVitie’s Digestives (plain, not chocolate!) can also be found in Oz but at high import prices. Good luck! I can’t wait to make these delicious sounding bars but I just had a question about the ingredients and the instructions for the sea salt and the water amount in the crust. I noticed in the ingredients it calls for 1/4 teaspoon fine sea salt but in the intsructions the salt isn’t mentioned. Then with the 1½ tablespoons water in the ingredient list when you go to the instructions it says only 1 tablespoon of water. So I was just hoping maybe you could tell me which amount is correct and if the salt is needed or left out because I cannot wait to make these! Thank you! 2. Mix the graham cracker crumbs, the butter and 1 tablespoon water and toss until moist. Hi Kasei, Thanks so much for asking the question. I’ve fixed the recipe so it’s correct now. You definitely want the salt (gives it great flavor). For the water, you want to start with 1 tablespoon and if it’s too dry, add the last 1/2 tablespoon. Hope you like it if you end up making it! Awesome, will do & thank you! I can’t wait to make these. I made your lemon bars and they were out of this world delicious.